Madagascar is definitely unique and the country is mostly consisted of the fourth largest island on the planet. Due to its geographical seclusion, we could find various unique flora and fauna. There are many bizarre and mysterious things that we can see, with various strange customs, sights and landscapes. The capital of Madagascar is Antananarivo. Madagascar has a generally tropical climate with pleasant weather throughout the year. The currency of Madagascar is Malagasy Franc and you should be aware that not all restaurants and hotels accept credit cards. It is highly recommended to use USD traveller’s cheque and travellers need to be aware that Malagasy Franc is not convertible. When you plan to go to Madagascar, you should get yellow fever vaccination. We should also have precautions against other diseases, such as malaria and typhoid. During an outdoor activity, it is better to get only bottled water. Some areas in Madagascar have minimal and basic medical facilities or non-existing medicine stocks; so it is important to know the local situations. The common language in Madagascar is French and Malagasy. Antananarivo is likely the first place in Madagascar that you encounter, especially because most travellers arrive using airplanes. The city is known for its colourful houses, exquisite embroidery products and friendly locals. You should also visit the zoological and botanical garden at Tsimbazaza. Ambohimanga is a sacred and old village, with a historical museum. Antsirabe is known for crater lakes and various springs. The area is dotted with huge granite mass. Ambalavao is known for its European vibes where you can find papyrus products. Another place that uyou should visit in Madagascar is the Ankarana Reserve, known for its spiky plateau and a hollow mountain. Inside, you will find a spectacular network of caves with probably hundreds of kilometres of tunnels. Where the caves have collapsed long time ago, you will find amazing pockets of sunken forest, which add to the incredible beauty of the area. 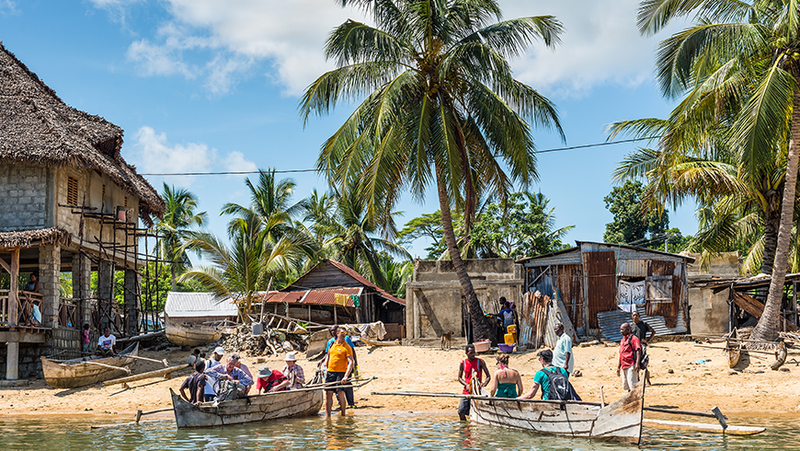 For coastal incursions, you should go to the Nosy Be archipelago, with its coral reefs and palm fringed beaches. It should be an ideal place for forest exploration, diving and snorkelling. There are also various fishing opportunities in the area. Libanone is known for its great tidal pools and swimming beaches. Nosy Mangabe is a popular reserve for lemurs, bright orange tree frog, leaf-tailed gecko and the aye-aye lemur. Perinet Reserve is the stronghold of Indri, which is often considered as the biggest surviving lemur on the planet. The area is also known for its bewildering plant diversity and scenic hiking trails. The Ranomafana National Park is known for a dozen of lemur species, as well as the white water river, Namorona and various endemic bird species. Near the park, you can also fund thermal baths, which are appropriate for you to relax. Morondava is known as a highly vibrant coastal town, located at the western shore of Madagascar, with its safe, wide swimming beaches. The Kirindy Forest is another place to find Baobab trees and various rare animal species.